Anthony Grant is expected to be recalled for Posh at Walsall. 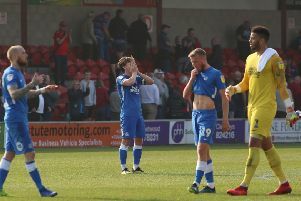 Peterborough United manager Grant McCann insists midweek results will be irrelevant when his team travels to Walsall for a League One fixture tomorrow (September 16). While high-flying Posh were bouncing back from a first League One defeat of the season to cruise past MK Dons on Tuesday (September 12), Walsall were getting thumped 5-1 at Rotherham. Heartbreak for Posh at Walsall last season as the home side take the lead in injury time. McCann knows that Posh will arrive at the Banks’s Stadium full of confidence, but he also knows the Saddlers are a formidable outfit on their own turf. Posh haven’t scored a goal in their last four visits to Walsall. “I was delighted with our own response to a setback against MK,” McCann stated. “That’s twice we’ve reacted to a defeat with an impressive win this season (Posh won 4-1 after losing to Barnet in the Carabao Cup) and that’s a very good sign. “But make no mistake this is a tough game tomorrow. Walsall had a bad result the other night, but they are very good at home. They will also be hurting and their manager will be seeking a reaction so we will have to be at our best to get the result we want. Confident Posh boss Grant McCann. “We’re excited about the rest of the season. We have got ourselves into a good position, but we’ve also set high standards we now have to maintain. McCann admits to a selection dilemma tomorrow after he made four changes to his starting line-up for the MK game. Midfielder Anthony Grant looks certain to return after serving a one-match suspenion, but a recall for skipper Jack Baldwin might depend on whether McCann reverts back to his three-man central defence against a team who also like to play a 3-4-1-2 formation. Sources close to the Walsall camp suggest former Posh midfielder Erhun Oztumer will play tomorrow. He went off early in the second-half at Rotherham. Saddlers boss Jon Whitney is expecting a reaction to that result. He said: “We are using Rotherham as fuel to move forward. Our pride has been dented, but now we have a chance to put it right against Peterborough. “Peterborough is a really tough game though. They are second in the table. Grant McCann has got them playing with a real energy. “They responded to a defeat against Bradford by totally outplaying MK Dons. “They are a threat. Jack Marriott is a proven goalscorer. They have brought in Ricky Miller from Dover. Marcus Maddison is a real danger. Walsall have won more home games in 2017 than any other League One club.